Sometime ago I found this adorable online boutique named Ruche and inmediately felt in love! They carry gorgeous and unique pieces with a vintage feel, exactly how I like it! Ruche always has the cutest pieces at a great price. The lovely Ruche is now one of my blog sponsors! It's great to have lovely stores, designers, photographers, bloggers or creative souls sponsoring and advertising on Boho Market. They're all very welcome! Hace un tiempo encontré esta linda boutique online llamada Ruche e inmediatamente me enamore de sus productos! Ellos tienes cosas bellisimas con un toque vintage como me gusta! Ruche siempre tiene cosas preciosas a muy buen precio. Ruche es ahora uno de mis sponsors en Boho Market! Me encanta tener tiendas como esta anunciando en mi blog. Asi que las boutiques, fotografos, bloggers, o gente creativa esta mas que invitada a anunciar en mi blog! Now it's time for the giveaway!! Yay! 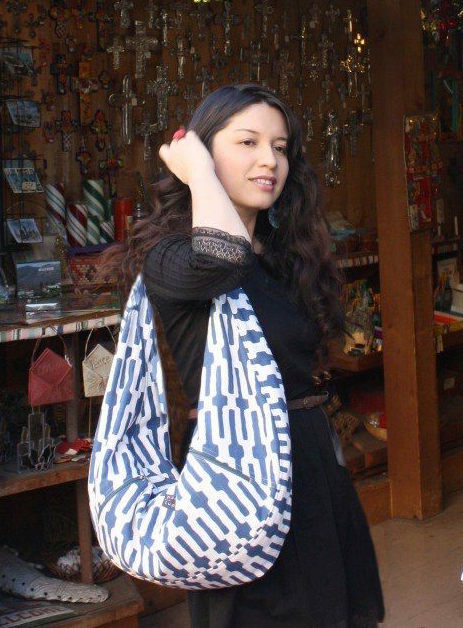 Ruche is kindly giving away $25 Gift Certificate to one lucky Boho Market reader! Isn't that lovely? 1. Follow my blog Boho Market, if you're already a follower, mention it on your comment. You have until Friday at Midnight to enter to this giveaway. I'll announce the winner next week :) Thank you so much for participating and good luck to everyone! 1. Sigue mi blog Boho Market, si ya lo estas siguiendo por favor mencionalo en tu comentario. Tienes hasta el Viernes 23 de Abril para participar :) Gracias y buena suerte a tod@s! Your outfit posts are adorable! Ruche rocks - such beautiful clothes & accessories and at affordable prices. Gorgeous pieces indeed! I'll check out the store Yes! I am also a huge fan of Ruche! Great giveaway! Kiss From A Rose Lace Dress. Oh lovely! I loved the rings to cute. One of my favorites is the miabella necklace . Im a follower as well. ahhhh i LOVE shopruche!! this is such an AMAZING giveaway!!!!! 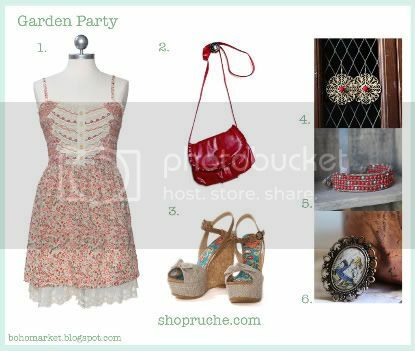 i am a follower (sandra chang) and the things i am eyeing from shop ruche are the floral mirage wrap dress, silhouette flower purse in sesame, and the eternal sunshine handbag!! i have subscribed through email . 3. I am an fb fan . just love your givaways. love that you are getting sponsors. love your blog! my favs are the floral mirage wrap dress and the roses in the dust dress. both are just darling and would fit with my boho artist look i'm always after! My favorite item is the baby blue eyes tank! *tweet tweet* I twittered about this giveaway!! Giovanna! I ADORE Ruche! I love the navy sailor dress (though it is incredibly difficult to pick just one!). And of course I'm a follower! It's hard to choose from soooo many adorable pieces but I would have to say that my favrite peice is the "Bring your best bow pocket dress"
And, I'm following the lovely Bohospirit on twitter! You rock! Oh, what a sweet giveaway! My fave is the peach nectar maxi dress!! My favourite is the "cross your pleats dress". I follow via google (follower name is Damla). My favorite is the "brunch with marilyn chiffon dress". The huckleberry ruffle dress is to die for!! I love it! I got here from the email, actually. so i'm an email subscriber. facebook fan. look for itsuko! Ah, you had a blogloving link. I'm following you through that too. following you on twitter. look for icitea. que chevere todos esos looks! un beso Giovanna! I love the country time afternoon dress!!!! So pretty and feminine! Come join my latest giveaway though, it's simply delicious! They have such a adorable stuff! 1.Im subscribed to yr blog. 2.I follow u on twitter. 1. I'm a follower of the blog. now we are twitter buddies! I follow you on twitter now! I am Jenniferb02! Oh, and I tweeted about this giveaway!! what a wonderful shop! full of so many items to choose from!!! i love the sioux tribal beaded necklace. It is so unique and would look great with jeans and a simple white tank! I love Ruche! especially the vanilla berries crochet bag! oh! it was so hard to choose just one ... well, i love the dakota prarie riffle dress and the tick tock pocket watch necklace...amazing! I'm following your blog. :) I love the on cloud nine ruffle cardigan by tulle. Thanks! I really love the dakota prarie ruffle dress! So cute! All of those outfits you put together are simply adorable... and thank you for pointing my toward Ruche! what a great shop. I loved everything, but maybe I'll just choose the lovebird swing necklace... great giveaway darling! Sign me up! Love the Into the Wild tank! I am now a follower of the Boho Market blog. I love the san miguel bohemian maxi dress. It has great colors and is totally me! :) Thanks for having the giveaway! What fun! I'm a follower. I like the box pockets purse in chestnut. I'm a follower via Bloglovin'. I really like the tulip dress that is gray as well as the plaid coat that is red!!! posted on my FB about this givaway.